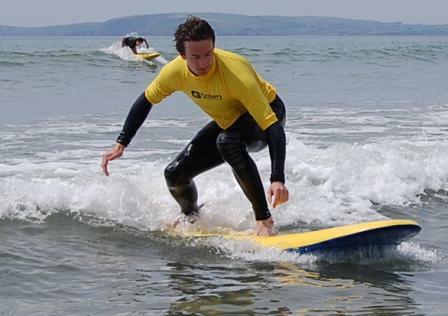 GARRETTSTOWN SURF SCHOOL IS OPEN ALL YEAR ROUND FOR LESSONS/RENTALS. During our Summer season we are based at the beach 7 days a week from 9am til 6pm and later if the surf is really good! Surf lessons are available 7 days a week so just call or email info@surfgtown.com to make your booking. Advance bookings for surf lessons are required as we have to assess tides and sea conditions on the day. We are always stationed at Garrettstown Beach every Saturday and Sunday from September to April weather permitting and weekdays for group bookings. Of course this is dependent on safe wave & weather conditions prevailing. Click here to be brought to the PRICES AND BOOKINGS section to book a lesson now. Lesson times are tide and weather dependent and a days notice is usually required to book a lesson,but when lessons are running on a specific day,there is no problem joining in,without a booking,as long as we are informed beforehand. This is to maintain a 1 to 8 (Instructor:Pupil) ratio. However phone 0878768549 or email info@surfgtown.com to book your place. You must also arrive ten minutes before your lesson time. We open each Saturday and Sunday at 9.30am and close at 5.30pm for hire. Mid week lessons are available all year round by appointment so call us up and book your chosen time. This is also the best time to book individual or one to one Improver lessons.